NATURALLY ELIMINATE MICE FOR GOOD - All Natural Organic formula safely repels Mice both in your home, around your house, or anywhere Mice are invading your property. Grandpa Gus's use 7% Peppermint Oil and Cinnamon Oil to repel mice and stop them from chewing, also stops rats and squirrels from chewing on plants and fabrics..
ECO-FRIENDLY AND MEANT FOR HOME USE - No harsh chemicals, glue traps, or rat poison used here. An anti rodent spray that keeps mice away without having to clean up trapped and poisoned rodents. 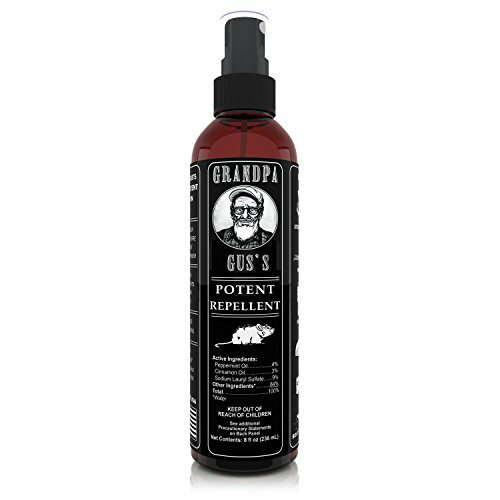 Grandpa Gus's Repellent can be sprayed in all areas of your home without worry. Grandpa uses 100% Natural Essential Oils that have been proven for decades to ward off Mice. Best Mouse Trap substitute. REPELS ALL TYPES OF MICE - Specifically formulated to repel all types of Mice including; House Mice, Field Mice, Deer Mice, Country Mice, as well as All types of Rats. Grandpa Gus is the most Natural and effective Mice Repellent on the market. Finally Rid your home of these disease carrying Rodents. 1240 SPRAYS & A MONEY BACK GUARANTEE - Laboratory tested in America, Grandpa Gus's Mice Repellent is guaranteed effective to work. Try 100% Risk-Free for 60 days and if you have not eliminated your mice problem we will refund 100% of your purchase. No questions asked. USE ANYWHERE - Can be used both indoors and outdoors. Safely spray in cupboards, cars and RV vehicles, attics, basements or anywhere mice may be invading your home. If you have any questions about this product by Grandpa Gus's, contact us by completing and submitting the form below. If you are looking for a specif part number, please include it with your message.